Sounding lovely and with a good array of controls, SpringBox is an affordable way to get quality 'twang' in your tracks. Four spring configurations. Simple tone shaping. Good stereo routing implementation. Easy Spread and Diffusion controls. Great on drums and guitars. A/B option not so useful. Springs cannot be altered individually. When it comes to characterful reverb, transducer-based designs such as plates and springs are always worth investigating. Typically found built into guitar amps, spring reverb offers a very distinctive sound that responds well to varying input transients. However, it can also work well with snare drums, acoustic guitars, keyboards, percussion and even vocals. PSP SpringBox (VST/AU/RTAS/AAX) includes 'tanks' of both 2- and 3-spring arrangements in stereo/stereo and mono/stereo configurations (see Spring architecture). You get controls for Diffusion, Spread and Pan/Balance, and like the recently upgraded PSP PianoVerb 2, it includes two full reverb setups for A/B switching. Each one features a high-pass filter (20Hz-2kHz), Damping (400Hz-5kHz), mid-frequency Presence boost (dark to bright), level Trim and Time settings. This last parameter ranges from 0-10, although 0 does still impart some decay. One particularly interesting element is the switchable Pan/Balance control, which enables you to either pan the stereo output jointly left or right, or rebalance the levels of the channels. If you've ever used a guitar amp spring reverb (or dropped said amp on the floor), you'll be familiar with the characteristically twangy sound it makes. At low Diffusion and short Time settings, SpringBox is very similar, particularly when using the most basic twin-spring mode. "You can clearly hear the distinct sounds of each of the two springs' twang speed and pitch"
In this mode you can also clearly hear the distinct sounds of each of the two springs' twang speed and pitch. However, as things get more complex (2- or 3-spring twin tanks, say), you can still make out subtle differences in pitch, but the sound becomes much smoother. This is where you'll generally get the most useable results. Hardware springs are limited by the length, tension and damping of their physical components. Being a plugin, SpringBox obviously offers more flexibility, but it also presents its parameters using more typical reverb terminology. So, although there's no pre- delay, the familiar settings that are on offer (Time, Diffusion, etc) make tailoring short, medium and long reverbs of varying styles easy. And, of course, the four spring configurations span the range from basic twangy sounds to more smeared and complex multiple reflections. Thus, SpringBox is perfect for recreating not only typical guitar amp spring reverb but also short reverbs for snares and toms - the Diffusion control is vital here, helping to reduce the twanginess. However, it can also generate great medium and long reverbs, and the high frequency response (with the damping kicking in at 5kHz) delivers a smooth, rich reverb that works a treat on all manner of sounds. Finally, it's worth mentioning the Quality button. In Brilliant mode, the high frequency response is improved at the expense of a slight increase in CPU hit. 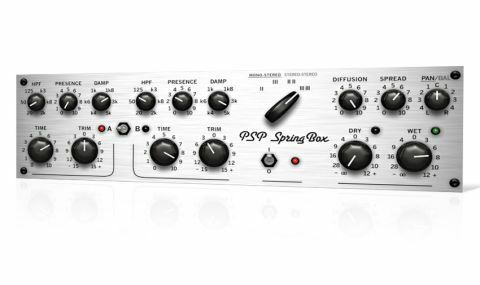 Overall, SpringBox is a fantastic little reverb with a convincingly 'classic' sound. As noted in Spring architecture, further control over individual spring tanks would be welcome, and we also feel that the A/B function is a little redundant, but if you're after an extra colour to complement your more refined algorithmic and convolution reverbs, it's an excellent choice.